The concept of edible flowers has always delighted me. 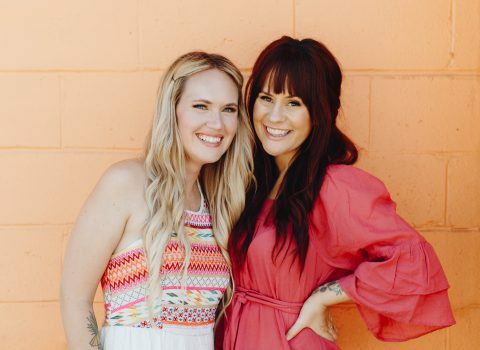 As a teenager, I was completely obsessed with faeries, so the idea of flower-covered cupcakes or lavender-flavored bubble gum was totally captivating. While the novelty has worn off a bit over the years, I still have a special place in my heart for delicate edible blossoms. Seeing their beauty encased in a sweet, sugary treat brings back all of those warm fuzzy faerie feelings. Tea party anyone? 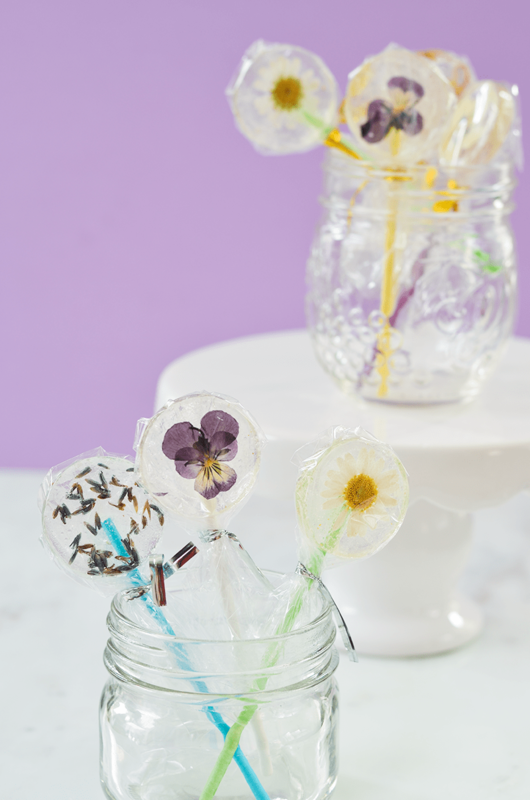 This project uses a super easy and virtually mess-free method for making lollipops. No need for candy thermometers or stovetop heroics—this recipe uses your oven and a silicone mold to slump hard candy into a pretty lollipop shape. I used peppermint candies since they were the only clear ones I could find. The flavor actually ended up being perfect! The pops were light and sweet, which matched the delicate vibe of the project really well. 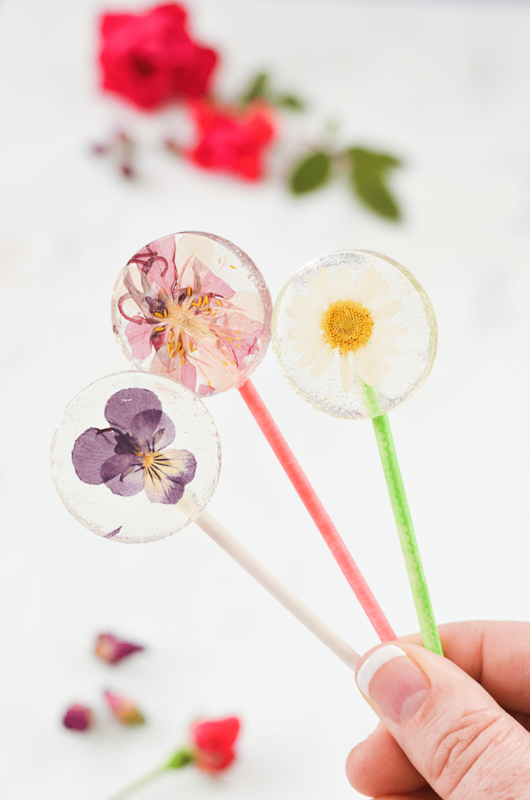 I also experimented with colored candies, but I found that the clear candy did the best job of highlighting the natural beauty of the flowers I was using. Speaking of the flowers—it’s really important to make sure to use only edible flowers for this project. While all flowers are pretty, plenty of them are also poisonous! Choose wisely. I used this guide to pick the flowers for my lollipops. 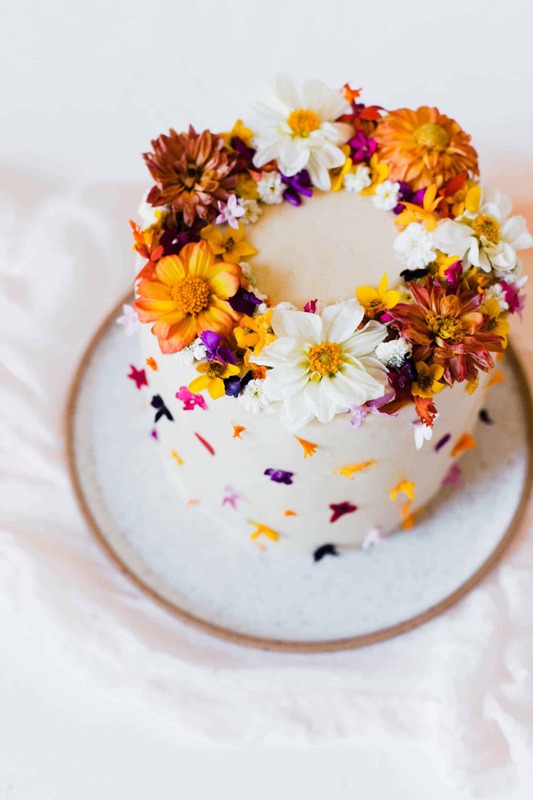 You can purchase pressed flowers online, but since there are a ton of edible flowers that can be grown in the garden, pressing your own flowers is one way to make this project even more special. I used daisies, pansies, columbine, marigold, lavender, rose petals, and tiny flowers from my cilantro plant that had gone to seed. Dried edible teas and herbs, like chamomile, mint leaves, jasmine tea, or lemon verbena would work really well too. Step One: Preheat oven to 250°F. Place silicone mold on baking sheet and add one flower (face down) in each cavity. Step Two: Place lollipop sticks in each cavity. Step Three: Place one or two peppermint candies in each cavity. If you are unsure of how much candy your mold will hold, try melting one candy first, then adding a second and melting a second time. I figured out that these molds worked best with two or three candies. Step Four: Place the baking sheet and mold in the oven and bake for 30-60 minutes, or until the hard candy has melted completely. 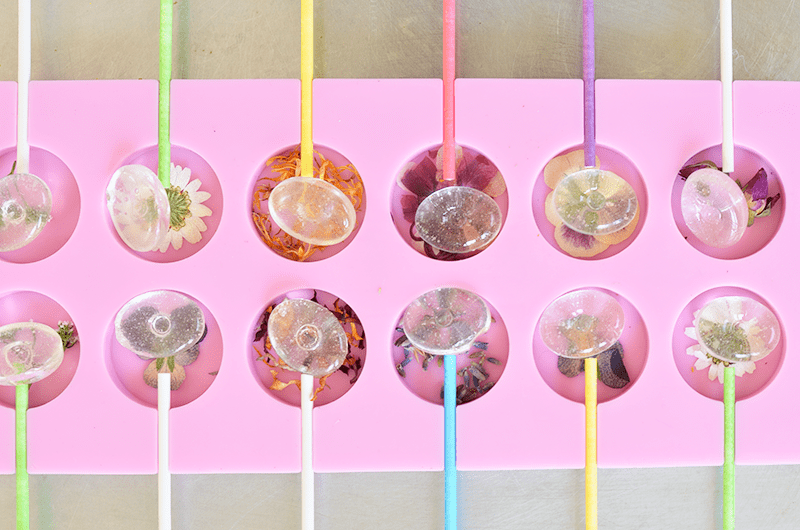 If necessary, rotate the lollipop sticks to make sure they are completely coated with melted candy. Allow the lollipops to cool and harden completely before gently popping them out of their molds. (This should take less than 30 minutes.) 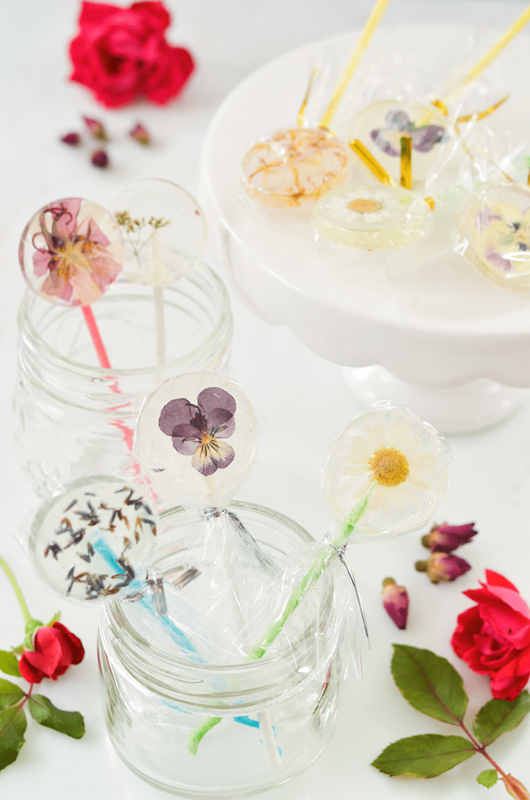 Cooled lollipops should be enjoyed right away or packaged in cello bags to keep them from getting too sticky. 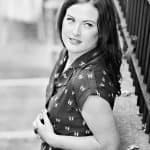 Credits // Author and Photography: Mary Helen Leonard. Photos edited with the NEW A Beautiful Mess Lightroom Actions. Wow, there is no way that anyone would assume these are homemade! 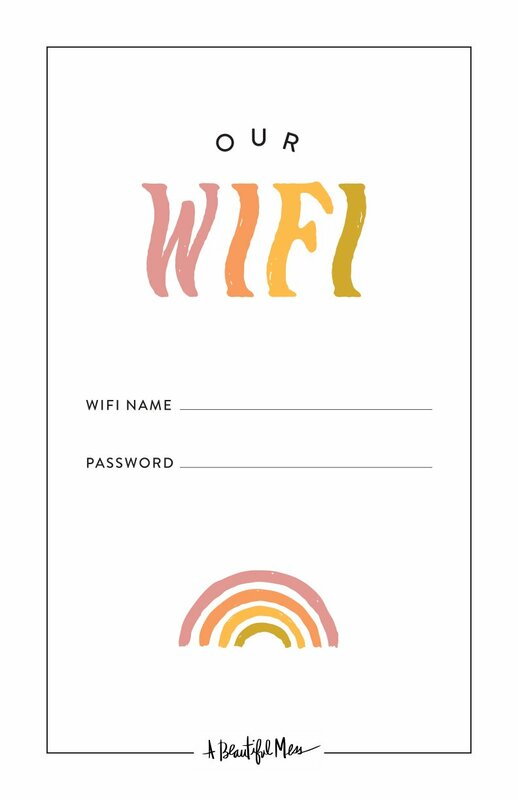 I’m having a girls’ spa party in a couple weeks and this looks like the perfect favor to give out! Any suggestions on where to get lollipop molds? This was huge in the U.S. in the 1980s. In France, lavender and violet have been classic flavors since forever, especially in the south near Toulouse and Carcassonne. Yup! We used paper lollipop sticks. You can find a link in the supplies list. These are beautiful! Thinking these may have to make an appearance at a wedding shower I’m helping with later this summer! So pretty! What’s the experience like eating the lollipops? How does the texture come through?? The flowers are so thin that they mostly dissolve as the candy is eaten – sort of like edible paper! 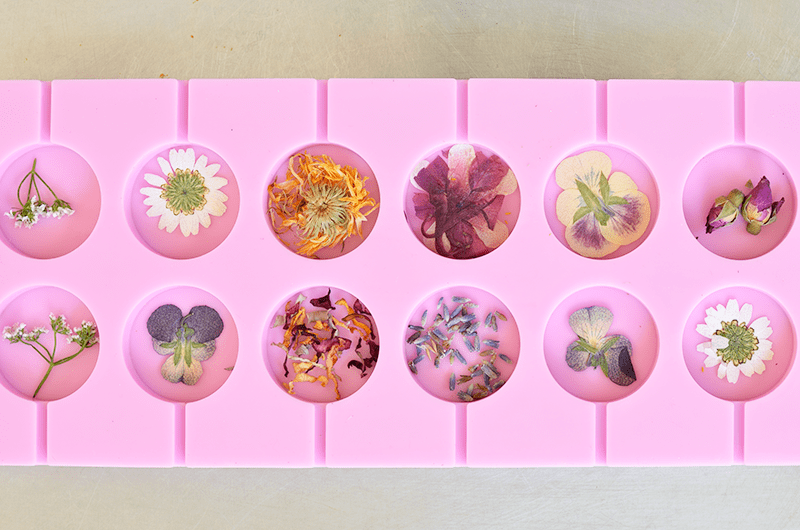 I experimented with putting the flowers on the bottom of the mold, in between two candies, and on the top. I found that placing them on the bottom of the mold with the candy melting OVER it helped them stay in place best. They have a tendency to shift or spread out in unpredictable ways if they are layered inside the lollipops. Be sure to get ORGANIC edible flowers, or grow them from seed yourself. You have no idea what has been sprayed onto the starts you get at a big box store, and it may not be food safe! Great point, Julia! Another good reason to press flowers from your own garden. I love these – they’re so pretty!! I LOVE these! I’ve also been enjoying all the edible flower recipes on Pinterest. They are way too beautiful to eat! I can see my cat being utterly fascinated by these! Anything flowers makes me ridiculously happy. Storing this away for future events and keeping them in mind for bridal shower favors! what a wonderful idea. these are so beautiful. they’ll be a big hit for any event. How beautiful!!! 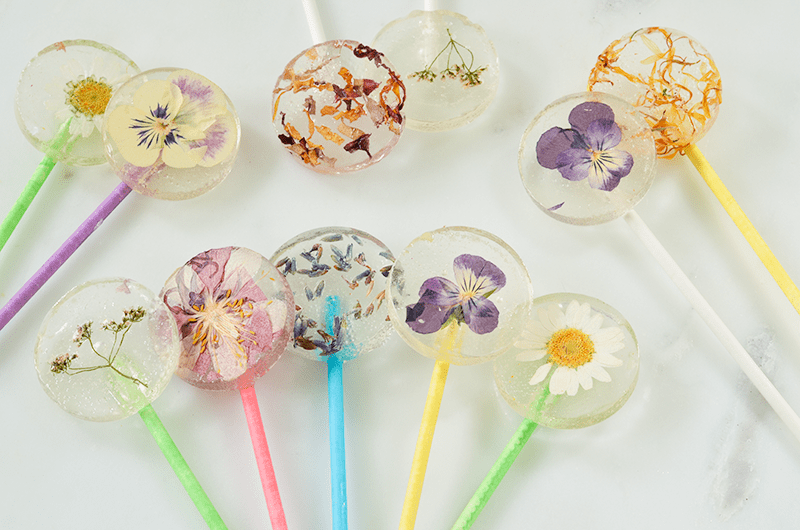 I really really want to try to make them (: I love anything with edible flowers. 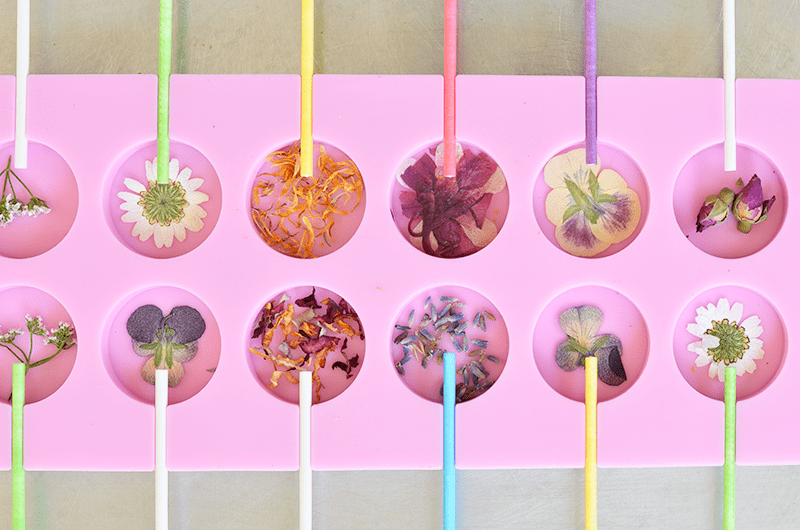 This year I planted several edible flowers in my garden, so as soon they bloom I’ll try tis diy! Okay, this is a new level of adorable. I’m afraid they’re so darn pretty, I wouldn’t want to eat them! 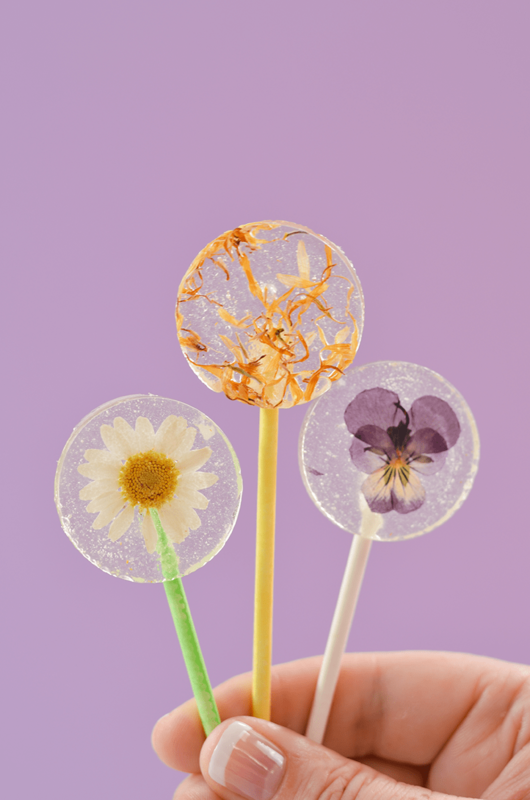 They’re particularly beautiful because as a lollipop, they resemble individual flowers on their own stem. I just love it! Love this idea! Thank you for it! It was the best thing I decided to make for my daughter’s birthday. The girls loved the lollipops so much. This year I made a flower birthday party for my girl, and added some flowers on top of the cake too. Greets! These are stunning, would love to make them for a wedding and wondered how long they keep after you make and wrap them? I was wondering, doo you think you could use your rose-flavored rock candy recipe and pour the mixture into these molds? Or would the hot mixture affect the flowers?